Have you heard of Totoro? Totoro is a cartoon character in a popular Japanese movie – となりのトトロ / Tonari no Totoro / My Neighbour Totoro. The movie is produced by Studio Ghibli and I’ve always been a fan of Studio Ghibli’s works, such as Spirited Away, Kiki’s Delivery Service, Howl’s Moving Castle, Ponyo etc. 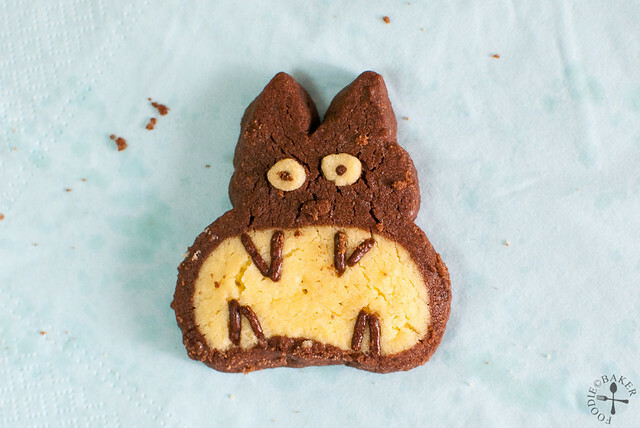 Recently my colleague has been posting lots of Totoro photos on my Facebook, which tempted me to create a Totoro cookie. Looks aside, even though they don’t look like Totoro at all in the end, I’m still glad the cookies turned out to be buttery, rich, fragrant and chocolatey – my mom asked me not to bring it to office to give away to my colleagues because she wants to snack on them! 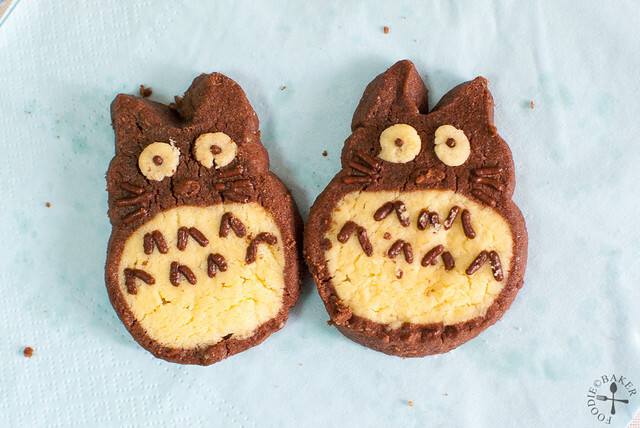 If you are feeling creative, do give these cookies a go and let me know how your Totoro cookies turned out! I’m sure you all are a lot more creative than me 🙂 If not, just roll them up into spiral cookies and bake away, they will still be very yummy! I’m submitting this to Aspiring Bakers #36: Choc-a-Cookie (October 2013) hosted by Genie of Honeybee916food! Using a hand-held electric mixer, beat the butter at medium speed for 30 seconds. Add in the sugars in 3 batches, beating for 1 minute after each addition at medium speed and scrapping the sides occasionally. Add in the egg yolk, one at time, and beat at medium speed for 30 seconds and scrapping the sides after beating. Beat in the vanilla at low speed. Scoop ⅓ of the batter into the Vanilla Dough flour and mix well. For the remaining ⅔ of the batter, add in 125 grams (1 cup) of the flour and the cocoa powder and mix well. Mix in more flour until it has the same consistency as the Vanilla Dough. Reserve ⅕ of the Vanilla Dough for the eyes. Shape into a penguin shape using the same method as the Penguin Cookies. Roll 2 more chocolate logs and shape into ears. Preheat the oven to 160 degrees Celsius. Slice the cookies into ⅛-inch thick and reshape them if necessary. 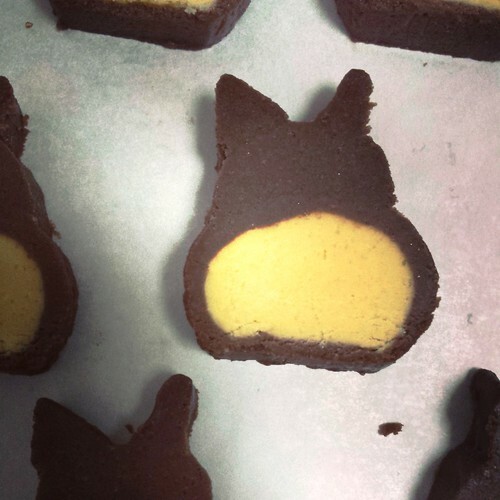 Roll small balls of Vanilla Dough and place on the cookie and stick chocolate rice down as the eyes. Use chocolate rice to decorate if desired. Place them about 1-inch apart on a lined baking sheet and bake for 12 to 15 minutes. The cookies will expand during baking. Cool the cookies the baking sheet for 10 minutes, then transfer to a wire rack to cool completely before storing in an airtight container. They are so cute, bet they a hit with children. 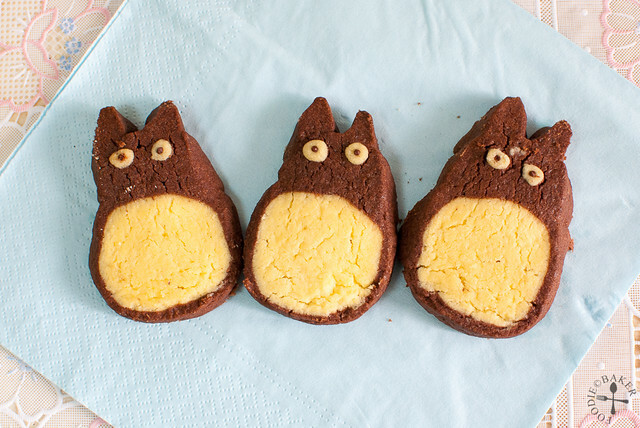 These cookies are so cute, and not only cute but look delicious too!